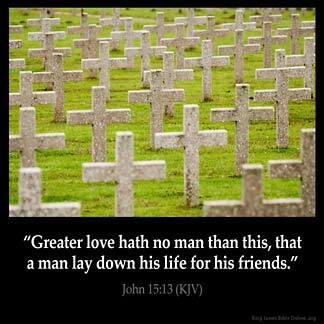 JOHN 15:13 KJV "Greater love hath no man than this, that a man lay down his life for his friends." 10If ye keep my commandments, ye shall abide in my love; even as I have kept my Father's commandments, and abide in his love. 11These things have I spoken unto you, that my joy might remain in you, and that your joy might be full. 12This is my commandment, That ye love one another, as I have loved you. 13Greater love hath no man than this, that a man lay down his life for his friends. 14Ye are my friends, if ye do whatsoever I command you. 15Henceforth I call you not servants; for the servant knoweth not what his lord doeth: but I have called you friends; for all things that I have heard of my Father I have made known unto you. 16Ye have not chosen me, but I have chosen you, and ordained you, that ye should go and bring forth fruit, and that your fruit should remain: that whatsoever ye shall ask of the Father in my name, he may give it you. Greater loue hath no man then this, that a man lay downe his life for his friends. No man hath more loue than this, that a man putte his lijf for hise freendis. Joh 15:13,14 Greater love hath no man than this, that a man lay down his life for his friends. The highest human exhibition of love that earth has ever seen was this. Christ was about to exhibit this highest type of human love by dying for his friends. He did even more, as Paul shows us in Ro 5:6, he died for his enemies, something that man had never done. Christ came into this world to serve a purpose... deity in service to die. The crusifiction was the only natural death that fullfiled the spiritual death of the soul. To die is to gain... dying out in the flesh means to be rid of our lusts and desire to sin no more. If your eye sins... cut it out... is a parable not a comand. Committing suicide is a sin. Giving your soul to free a brother or sister in Christ from sin to save that person from eternal hell is what Christ wants. Let the supernatural type the natural and watch what God can do... What a mighty God we serve. If a friend was sinning and for me to save that person would cause me to sin would I not want to save that person's soul? Though God knows my heart and because I trust in my God... all is well. Even if my flesh body gets in the way. I am not ashamed to serve my God. Edward, I do not think, this verse meant to commit suicide... We can die for a friend by our enemy, taking our life fro loving that person, but to take our own life is a sin.. For we have to remember God feeds the birds an animals in the woods, we should not worry about who feeds them, for God does supply to those who truly love him... There is no excuse for suicide, the thought could have been nice, but besides being a sin, it would have put his family in a pain an suffering state for his killing himself.. Giving up your life, in this text is, Loving all no matter what, an living the way Jesus did, taking on a life that can be a harmful one too you, but trusting it God to give you strength..